I had a decorative wall hanging: a wooden heart, some metal, some felt, some cones. I liked neither the dark gray of the felt nor the composition. 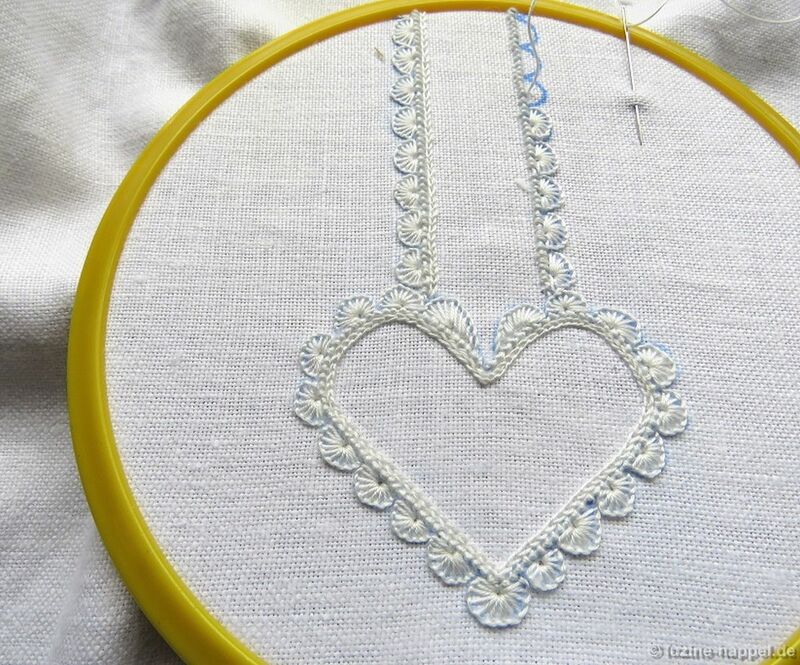 I wanted to pep it up with some whitework. 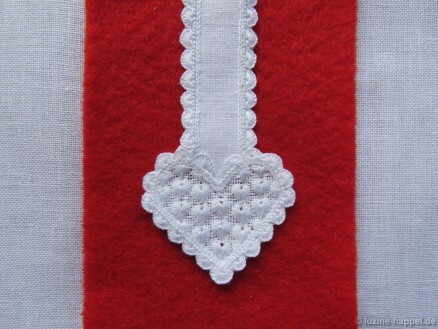 Instead of the narrow band with the cones at one end, I thought of an embroidered border with half-eyelet scallops and a small heart at one end. And instead of the metal heart, I thought of an embroidered and then cutout heart. And finally, I considered changing the dark gray felt to red. My graphic designer also made a separate design of the straight border. It is also included in the download file. 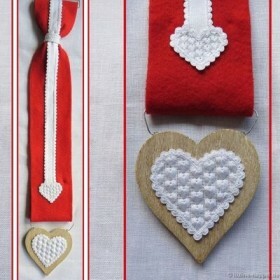 With the help of the additional straight border design, I was able to lengthen the band to fit my decoration. 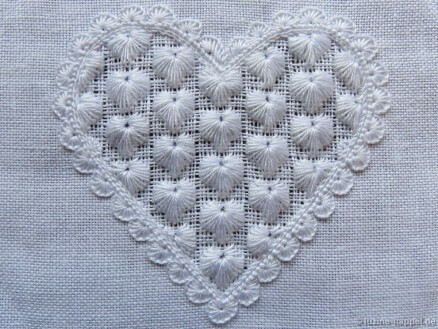 I used linen with a 16/cm thread count. 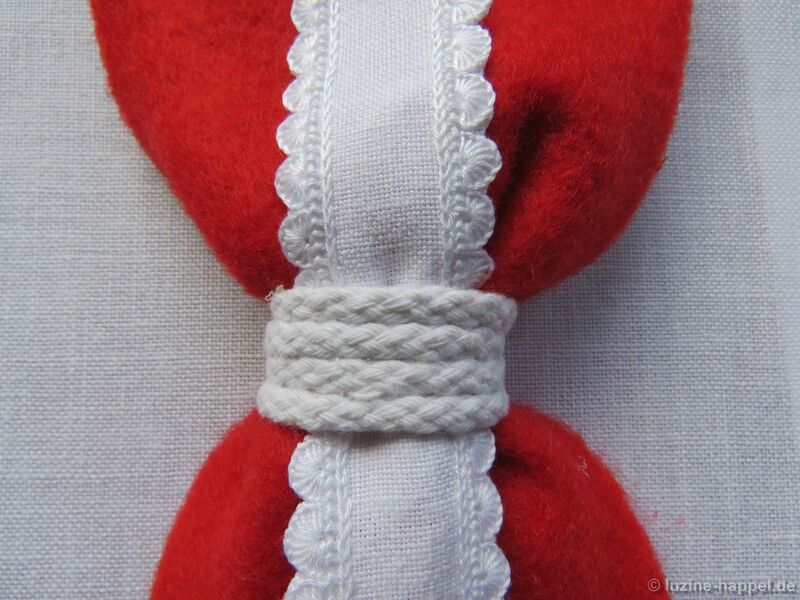 With short running stitches along one fabric thread, I marked the position of one edge of the band. 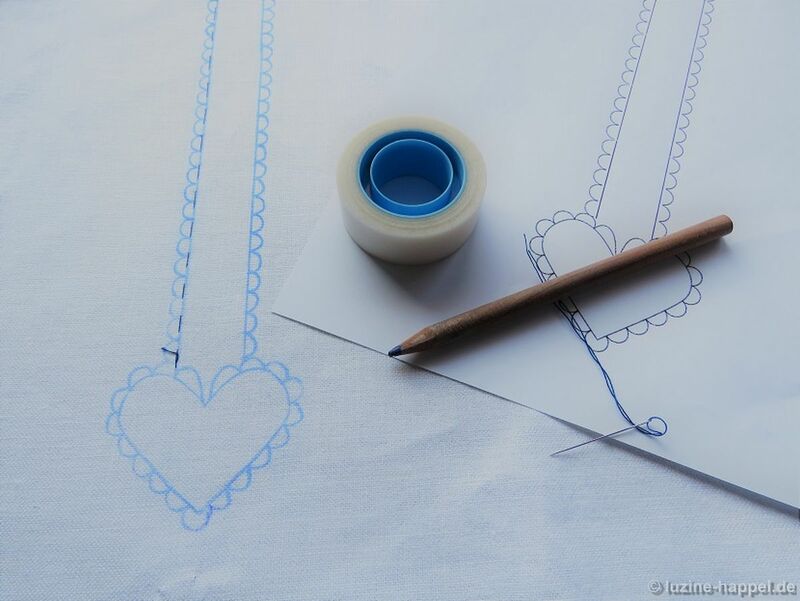 Then I transferred the design to the fabric using an iron transfer pencil. Using coton à broder No. 16, Coral Knot stitches were worked along the perimeter of the heart and along the straight lines. Using coton à broder No. 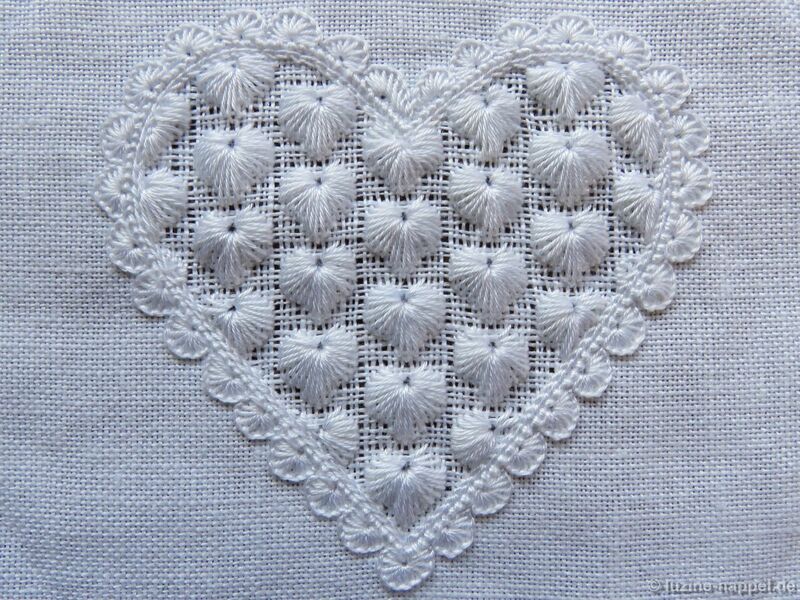 25, half-eyelet scallops were worked outside; and using coton à broder No. 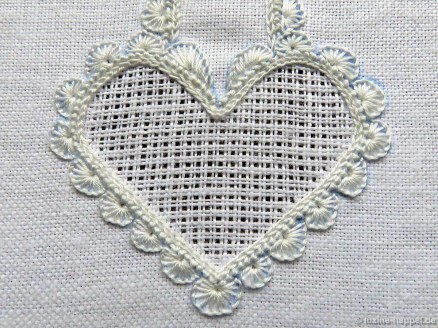 30, Chain stitches were worked inside the Coral Knot stitches. 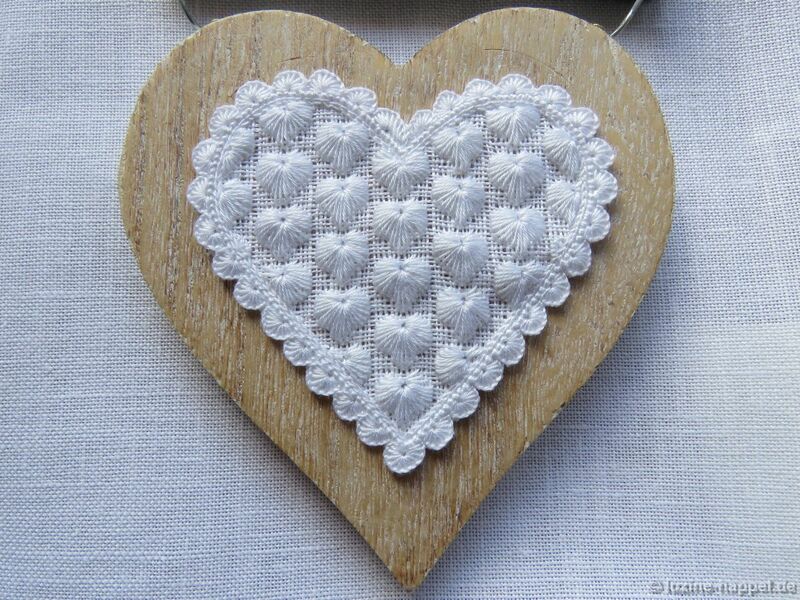 Inside the heart shape, a special Limet grid was established by cutting 1 and leaving only 2. 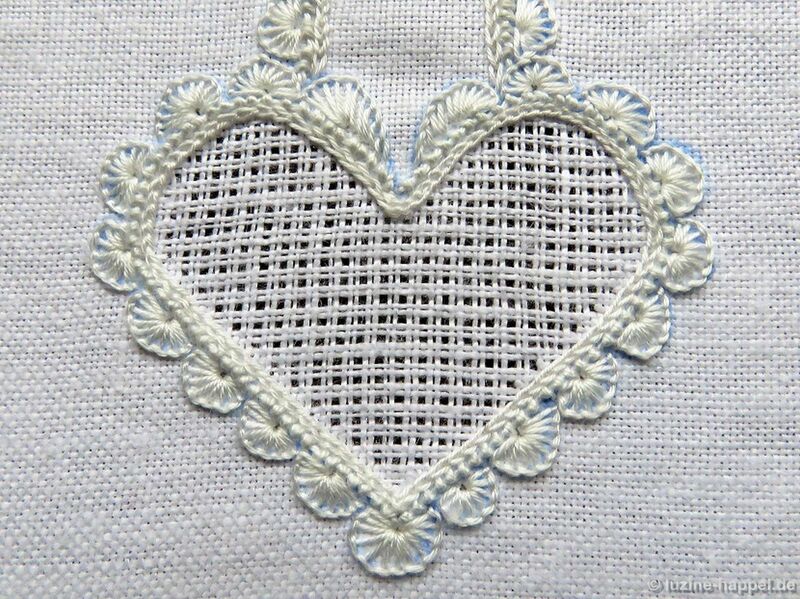 This was done so that the planned square-eyelet pattern would remain compact and appropriate for the relatively small space of the heart. Using coton à broder No. 30, filling pattern 481 A was worked. The piece was boiled, starched, ironed, and then cut. From my wall hanging, the dark gray felt was removed and replaced with red felt. 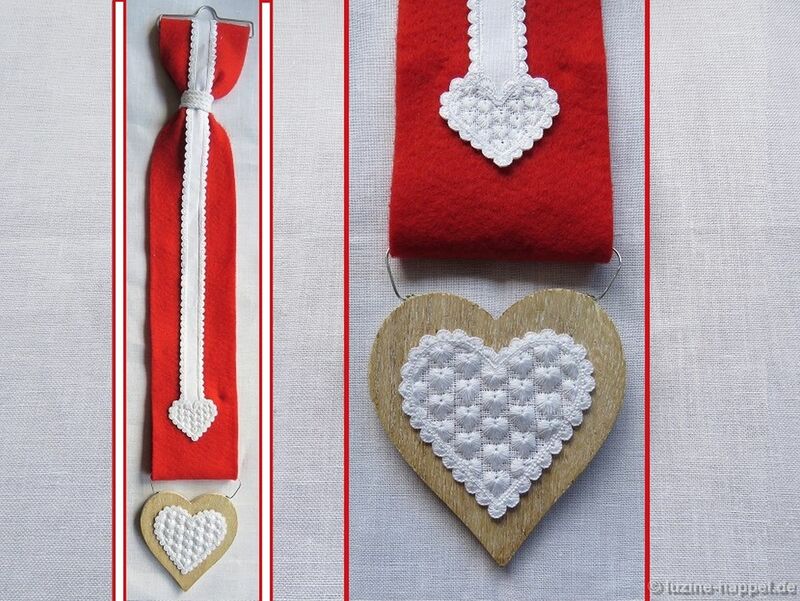 The narrow light gray felt strip with the cones at the end was removed and replaced with my embroidered heart band. 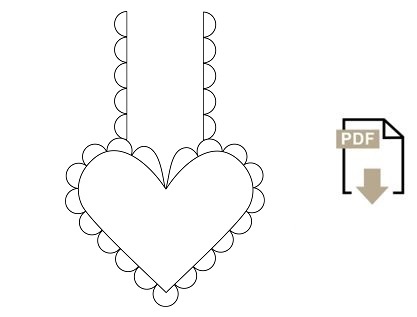 I sent a copy of the wooden heart shape to my graphic designer asking for a matching heart design. You can find it in the previously published article. 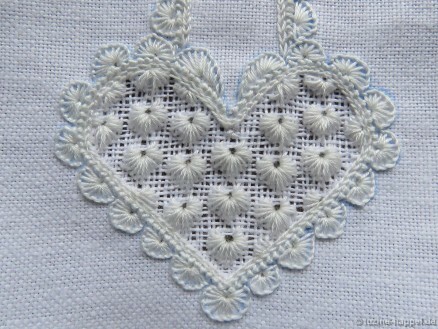 I embroidered the heart on 13.5/cm thread-count linen and used coton à broder No. 25 for the filling pattern. I chose filling pattern No. 481 to match the small heart on the band. After boiling, starching, ironing, and cutting, I mounted the embroidered heart onto the wooden heart using double-sided tape. My pepped up wall hanging is finished; doesn’t it look so much better than the original? Another way to use the design is to make a bow by adding a heart at each end of the band. I made a mini version forgoing any filling pattern. 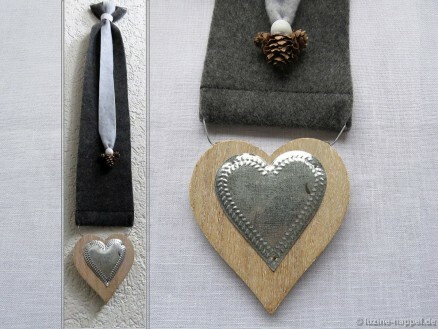 I used it as a collar for my wooden reindeer. 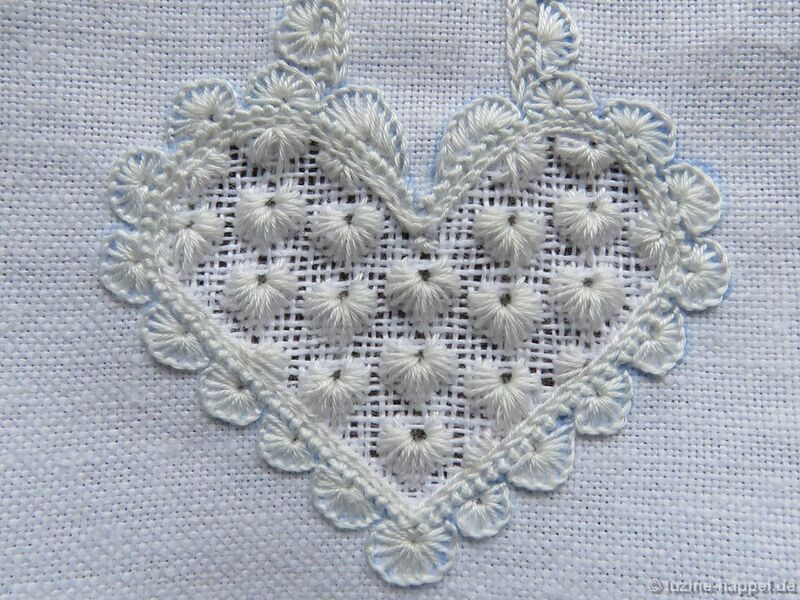 Yes, it is always good to practice in smaller pieces than to start with an elaborate embroidery which sometimes will become never finished.If people are certain to enjoy Schwalm whitework. they can begin a more elaborate pice. I always try to show both, small pieces for practicing and and more elaborate up to beautiful embroideries for finding complete expression in stitching. Das ist so schön! Ich liebe der Rand! es gibt so unendlich viele Möglichkeiten, Stickerei immer wieder anders zu gestalten. Da ist für jeden Geschmack etwas dabei. Die Vielfalt macht die Stickerei so interessant. Thank you for the compliment, Francis!